While there are several ways and means of installing Epoxy Sinks, the recommended method is illustrated below. The following is a mechanical method of supporting or hanging undercounter mount epoxy sinks as a sink support assembly. A chemical resistant putty or epoxy adhesive is suggested to be applied to the top surface of the nominal 1/2" (12.5mm) thick sink rim in order to form a chemical resistant and liquid proof seal or bond between the Duratop Epoxy sink and the underside of the countertop. The countertop material may be either Duratop Epoxy or solid phenolic Resistop. The suggested putty or adhesive is either Smooth-on Epoxy adhesive, General Electric SE 1203 or Dow #732 RTV Silicone Elastomer materials for the application or equivalents. the 1/4" (6mm) diameter "J" Hook supports are ratcheted up or drawn up evenly to maintain the intended level of the sink and the natural drainage within the sink contours. 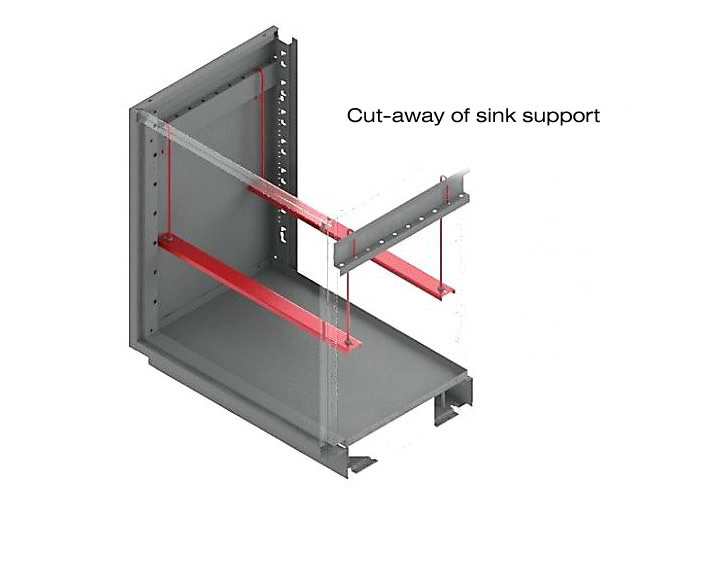 The specification in Division 12 calls out "Sinks to be supported from below by metal frame and hanger brackets. 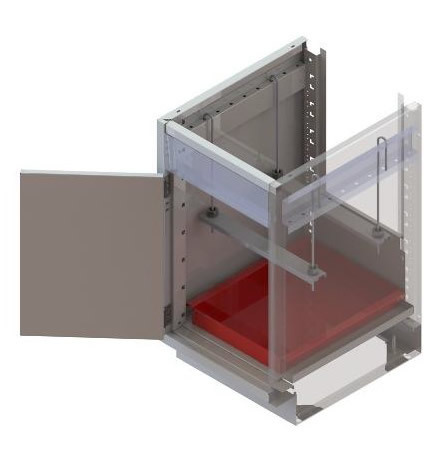 Frame to consist of two adjustable channels of 11 gauge steel 1" x 2", extending across width of cabinet, and attached to 1/4" to 3/8" diameter threaded hanger rods. Adjustable channels shall have a chemical resistant finish. Use adjustable support system as recommended by the casework or sink manufacturer." Sink Supports are supplied oversized for on-site cutting in a size of 57" length, field cut to fit wood or steel casework.